Our edible image Cake Sticker sheets are perfect for decorating all sizes of cakes, cupcakes, brownies, or any favorite treat. Edible Cake Stickers work great on frosting, icing, whip cream, fondant, gumpaste, fudge, and ice cream. You simply peel and place on your frosted treat! You can create festive, designer looking treats for a fraction of the cost when purchased! Measurements are approximate, as each cake will vary in size depending on baking and the thickness of the icing applied. Measurements are based on a frosted cake (1/8" thick). 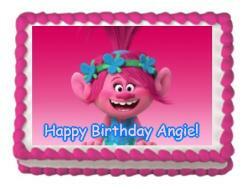 Round images are designed to fit on top of your cake, cupcake, cookie, or any treat. Strips are designed to adorn the sides of your cake. Perfect for round, square, and rectangle cakes. Strips can be cut to adorn cookies as well. Full sheets are designed to fit square or rectangle cakes or for customizing the shape; simply cut with scissors. 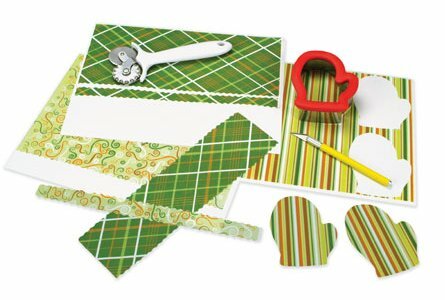 Perfect for edible scrapbooking! Measures 7.5" x 10" each. Cake Stickers can be easily city with sharp scissors or a razor knife. Return all images to the re-sealable bag as soon as they are no longer needed. Measure and cut the last strip while it is still attached to the backing strip to avoid waste. Use an X-Acto™ knife to trim the last strip from the bottom up after applying to the cake to avoid tearing. Use a pastry wheel cutter with the sharp edge. Cutters are available with one straight edge wheel and one zigzag edge wheel. These are wonderful for cutting the straight edge or adding an optional zigzag pattern to the edges of your Designer Print Cake Sticker. This way, you can make sure your Cake Sticker is cut evenly and straight on both sides. Alternatively, you can use a ribbon insertion tool with the pointed blade or an X-Acto type razor knife to trim or cut to your desired size. Try cutting Cake Stickers with sharp cookie cutters to create wonderful shapes. Use the cookie cutter to cut the same shape out of cookies, brownies, or rice crispy treats then adorn it with the same shape Cake Sticker for a treat that will knock their socks off. When applying edible Cake Sticker strips, after you have wrapped the cake and are applying the last strip cut the excess part of the strip while it is on the cake. It's best to make that last cut in an upward motion, so you have a clean even cut that does not pull the Designer Print™ away from the cake. Or, if you have a steady hand, you can just use scissors. Create amazing and festive deserts of all kinds. Simply cut Designer Edible Images to fit cookies, brownies, fudge, chocolate, and rice crispy treats for a festive, eye catching presentation. 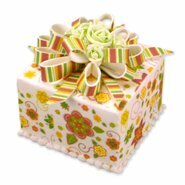 Make beautiful bows and ribbons to adorn cakes and cupcakes. Present a collage of special photos that is sure to bring back special memories.